May. Something for Mom or a Grad perhaps? So if you can't give them the airfare, here's a great way to give some great trips and tips. These are stories of family and travel. Remember the actor Andrew McCarthy of St. Elmo's Fire? He describes exploring hs Irish roots. Explore the Philippines with Barbara Noe and find out about her mother's girlhood adventure there. The end of each section gives more info on what to watch, visit and read. Use the information at the back of the book to do real research on your family tree. Happy Trails to you!! Addressing the explosive growth in ancestral travel, this compelling narrative combines intriguing tales of discovery with tips on how to begin your own explorations. 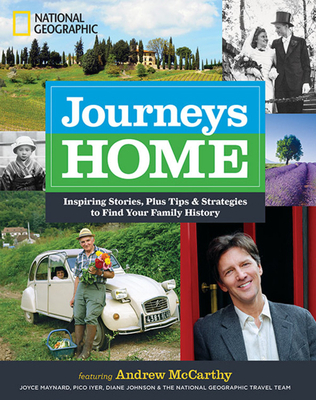 Actor and award-winning travel writer Andrew McCarthy’s featured story recounts his recent quest to uncover his family’s Irish history, while twenty-five other prominent writers tell their own heartfelt stories of connection. Spanning the globe, these stories offer personal takes on journeying home, whether the authors are actively seeking long-lost relatives, meeting up with seldom-seen family members, or perhaps just visiting the old country to get a feel for their roots. Sidebars and a hefty resource section provide tips and recommendations on how to go about your own research, and a foreword by the Genographic Project’s Spencer Wells sets the scene. Stunning images, along with family heirlooms, old photos, recipes, and more, round out this unique take on the genealogical research craze. Featured author ANDREW MCCARTHY is an actor and television director (known for his roles in St. Elmo’s Fire, Mannequin, Weekend at Bernie’s, Pretty in Pink, and Less Than Zero) who also has an illustrious writing career. He is an editor-at-large at National Geographic Traveler, and has written for The New York Times, The Atlantic, The Wall Street Journal, Slate, Travel+Leisure, Afar, Men’s Journal, Bon Appétit, National Geographic Adventure, and others. The Society of American Travel Writers named him 2010 “Travel Journalist of the Year,” and he was cited three times for notable work in the “Best American Travel Writing” series. His 2012 memoir, The Longest Way Home, became a New York Times bestseller. "Family secrets, mysteries, and lore are the impetus for the emotion-filled sojourns described in this beautifully illustrated essay collection and genealogy guide."